In my endeavor to make everything at home I found myself waiting patiently for my store bought tomato ketchup to run out. This is not an ingredient I use often as I only really have ketchup with my hotdogs. I like a traditional sausage with sauerkraut, mustard, mayonnaise and tomato ketchup between a soft wholewheat roll. I acquired this taste when I was in New York in the late 1980’s as the street vendors hotdogs are something to be sampled over and over again. Most recently this is only ever a weekend indulgence and not something we have every weekend either. I must say that I battle to find sugar free ketchup and I try and not read the ingredients included in any store bought produce, other than to see if it has sugar in it. The other ingredients would probably put me off purchasing the item, but as it is only the sugar I have a problem with, this is all I look for. But, it is because of all the other ingredients that I have wanted to make my own ketchup. This will not keep forever on your shelf. You need to refrigerate it, and use within 6 months. But, it contains only goodness! As you can see, this tomato ketchup is not red – I used orange tomatoes, and that influenced the colour. I am sure that the riper your tomatoes are, the redder this ketchup will be. What I can tell you is that it tastes amazing. Not at all like your store bought equivalent, so it may take some getting used to. 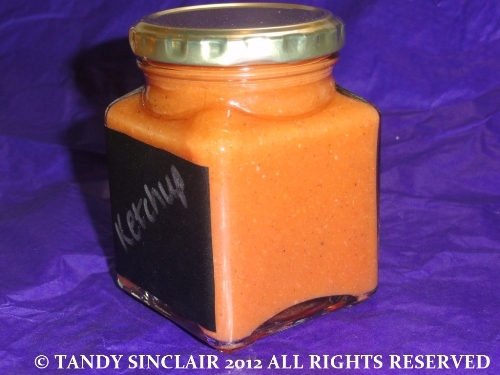 Do you prefer home made or store bought condiments? This will keep for 6 months. Replace the allspice with smoked paprika. I have boxes of tomatoes ripening in my basement, and was thrilled to find your recipe. Will definitely give this a go! Thanks! Thank you for such an amazing theme! I preferred homemade all the time, anytime. Keeping food pure like you have done here is the best way to go. That’s a good question. It depends, really. I’d prefer to make or grow everything myself, but I don’t have the time or the space. But I do grow some things [like parsley, lemon thyme etc] and make others [reasons vary from “I prefer my own version”, “it’s too expensive to buy all the time”, or “it’s healthier”. I bet this tastes fabulous Tandy! Homemade always trumps store bought. I love the color! You’re right, all the extra ingredients they put in ketchup is really off-putting. Give me the home-made version with tomatoes and spices any day. I’ll have to give this recipe a try! Really great idea. Would prefer homemade any day. Home made baked beans are fabulous. I am sure I could try those as well! Home made wins over store bought every time. You have me drooling for a hot dog now!